Neither of us intend it, I’m sure, but our conversation circles back time and again to a once-forgotten corner of Ordsall on a bitter December day in 1985. 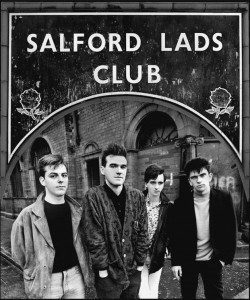 I’m on the phone to Stephen Wright, the photographer who captured what is arguably the defining image of The Smiths; the four co-conspirators huddled by the closed doors of Salford Lads Club, on the threshold of greatness. There’s more to Wright than the inner sleeve of The Queen Is Dead, of course, as Central Library‘s exquisite miniature of a retrospective makes abundantly clear. Indeed, up until that group portrait, he had considered himself a concert photographer, fixing the fleet velocities of Manchester’s early-80s live scene into images distilling the giddy potency of the times. A Southerner by birth (he’s from Reading), Wright nevertheless has an affinity for The North, averring “with little exception, people would treat you right”. 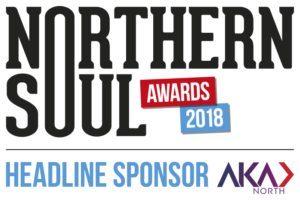 Privation notwithstanding, it was a time when things fell into place, whether that place was the Apollo where the neophyte photographer would “always go for a pint with the head of security” or The Haçienda, where “they gave me an honorary membership plus one”. Likewise, the circumstances leading to Saint Ignatius Walk were equally serendipitous, a combination of the fortuitous and Morrissey’s caprices. Stephen was recruited because Steven “liked the Trade Hall flowers pictures” (a frenetic live concert set – also in the current exhibition – that he had speculatively forwarded to Rough Trade). 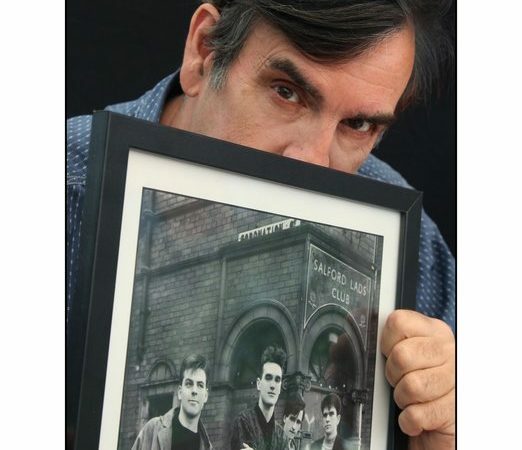 Morrissey, it seems, chose the location, although the photographer “honestly didn’t know what the Salford Lads Club was…since we didn’t have the internet, everything was folklore or what you read”. But Morrissey’s songwriting partner was less enthusiastic. 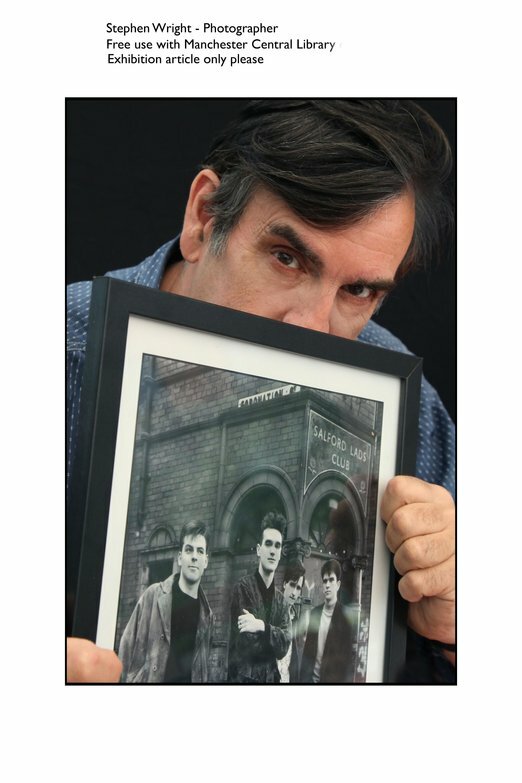 “One of the biographies, it must be Johnny’s, he didn’t like it.” Indeed, Marr looks to be shivering against the prevailing winter cold, while his becardiganed accomplice “stands there, arms folded and smirking slightly like the Mona Lisa”. 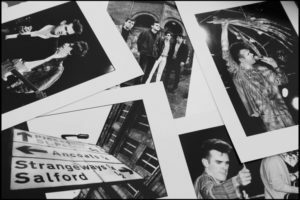 From Wright’s perspective, at least, for years after “the postman bent a proof copy of the album and shoved it through my door” there was no particular interest in what was one Smiths’ photograph among others. 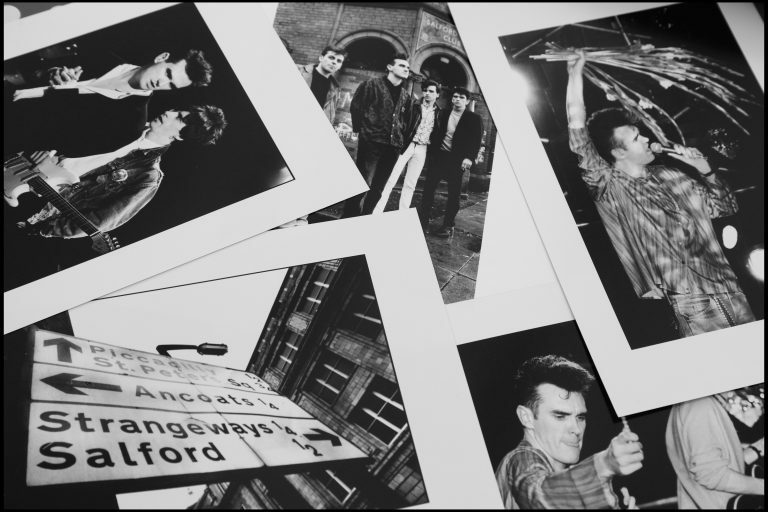 He dates the shift towards its canonisation from the release of You Are The Quarry, as Morrissey’s return from the chart wilderness coincided with a resurgence of interest in the group. It was about the same time, too, that his father passed away. Still bereft, he called Leslie Holmes at Salford Lads Club. Holmes’s overture led to a charity shoot on a dreaded sunny day, some of the proceeds going to the hospice which had cared for his dad. Especially in such circumstances, he recalls, “people being straightforward and nice was a very warming experience”. There is a real warmth in Wright’s voice as he talks about his subsequent long association with the establishment, an affection that’s especially evident when eulogising the “bloody charming” retiree volunteers who are its heart and soul. 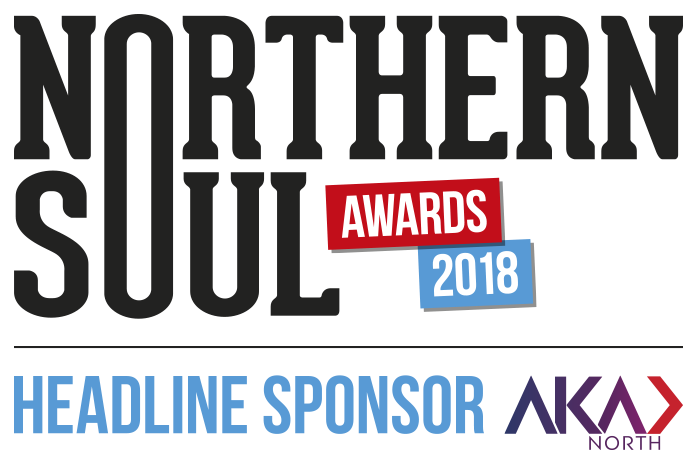 It is clear that his honorary membership of this club resonates more meaningfully than his similar arrangement with The Haçienda. It’s this affiliation, perhaps, that has led Wright to a greater appreciation of what the photograph has come to mean for others, all the more so since he decided to license it to the club for a calendar year to use as a bottle green T-shirt “and this venture was to take some of the kids over to North America”. Sales eventually reached the not inconsiderable sum of £67,000, and Wright seems faintly amused that they benefited Salford lads who “have no interest in The Smiths at all”. From Reading to Ordsall and back again, it was a pilgrimage worth making. To read Northern Soul’s review of The Smiths 1984–1986, Stephen Wright at Central Library in Manchester, click here.